Dunkirk, located on the northern coast of France and the site of an impressive World War II event is the star of two movies this year, Their Finest (April) and Dunkirk (July). If you haven’t heard of the events that transpired at Dunkirk until now - and you had an American education - it’s probably because we didn’t join WWII until the end of 1941 and the battle at Dunkirk occurred in the middle of 1940. Their Finest, a romantic drama focused on the Ministry of Information: Film Division and the artists tasked with keeping morale high in the midst of raid sirens and rubble mentions the lack of U.S. involvement and considers how to “sell” the idea of joining this battle to the U.S. government. Dunkirk, Nolan’s dynamic action-drama, focused primarily on the British forces with some mention of “frogs”. Not unsurprising, both films had British producers. Gemma Arterton stars as Catrin Cole in Their Finest, a woman hired to the Film Division to write “women’s dialogue” - aka “slop” - who works under Tom Buckley (Sam Claflin). Together they write more compelling stories that engage male and female audiences. The Ministry of War frequently drops by to review the film and add their notes. Their intention is to inspire confidence in their civilians and they even attempt to “sell” the war to the U.S. by having a hero American soldier played by a blond-haired American. "Good think you're army and I'm navy." "The actor was ruining the script." "Of course he was, he's an actor." Vastly different is Dunkirk, whose focus is on the details of the battle and how it plays out by air, sea, and land. Soldiers and civilians alike act with heroism, fear, pride, honor. Tragedy is constant. We follow numerous soldiers and how they navigate survival as an exhausted team and as frightened individuals. Their Finest feels almost ethereal in the way it portrays a sort of rosey-glasses romance during a time of war they don’t shy away from the bloody violence of war. 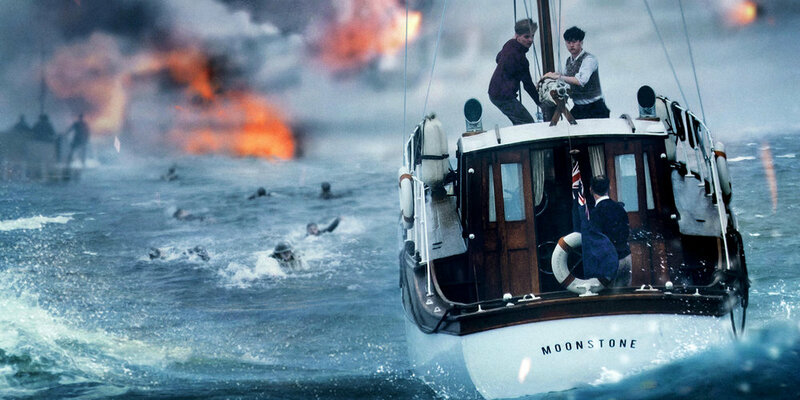 Dunkirk immerses you in seconds - the constant shifting from air to land to sea adds to the already-chaotic on-screen environment. Neither film feels the urge to end with an overly-happy or sappy scene - which might be more indicative of a film produced by non-American studios and individuals than the content of the films themselves. "All we did was survive." "A lot of men are scared we won't go back into our boxes. It makes them belligerent." Dunkirk shows what the men are facing as soldiers while Their Finest offers the new routine “back home” as women take over male roles. Fionn Whitehead, Aneurin Barnard, and Harry Styles are three of the young men in Dunkirk who lack experience on the ground - they’re soaked, cold, and trying to survive. Tom Hardy and Jack Lowden are pilots maneuvering through the sky targeting Axis planes to prevent the powerless soldiers on the beach from being slaughtered. Barry Keoghan, Mark Rylance, and Tom Glynn-Carney are civilians piloting their yacht to provide aid along with thousands of others who sail their boats to Dunkirk. Cillian Murphy is another British soldier who finds himself stranded atop an overturned boat. Many of these actors are relatively unknown - which better serves to to immerse an audience in the story. I will say when I saw Styles I was a bit put-off and figured it would be an unimpressive performance in a great film. I’m no stranger to being wrong and he did well alongside his cohorts. Hans Zimmer (composer) and Richard King (sound editor) crafted a stressful environment by overloading your auditory sense with layer upon layer of nature, machine, and human noise. Civilians pilot a yacht to Dunkirk in Dunkirk. The dramatized "for film" version of the same event in Their Finest. While these are very different films both have beautiful cinematography and are enjoyable - definitely worth the two hours they each consume.